Who's ready to see what was in the box this month? 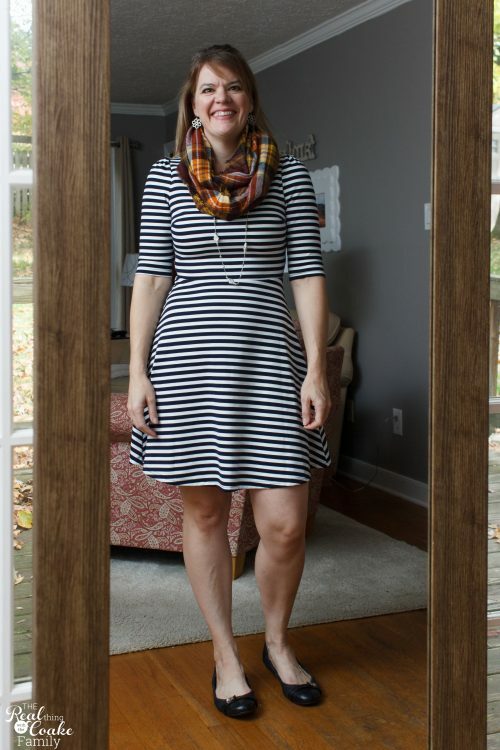 I've got another Stitch Fix Review for you today with some fall fashion. Did you see me opening this Stitch Fix box on Periscope? I was hopeful when I opened the box, that it was going to be a good one. I'm not generally one for beating around the bush and I'm not planning to today as well. For me, this box was awful! Yep, just straight up awful! I felt like the stylist didn't even bother to try to get to know me or my preferences or my lifestyle. For goodness sake, I have marked in my profile to never send me scarves. I hate them. Got a scarf. I also have marked down that I rarely wear dresses. Sent me a dress. On top of that the combinations that this stylist suggested that I wear together were just awful to me. They are things I would NEVER wear together. Now, maybe I'm super conservative in what I will wear together, but I didn't like the combos. All of that being said, the individual pieces that were sent were cute. They just weren't me and weren't things that fit my lifestyle or are things I would never wear in the combination my stylist suggested. So, now that I've given you that lovely introduction, let me also tell you that I still like Stitch Fix. I still plan to stay with Stitch Fix…at least for another box or two. If I get another box or two like this, I will stop the service for sure, this one was that bad for me. Before I get into the meat of this fix, let me just take a second to explain what Stitch Fix is…just in case you haven’t heard of them yet. In my opinion, Stitch Fix (affiliate links throughout this post) is perfect for busy moms (like me) or people who don’t like to shop (like me) or have a fashion addiction and have always secretly wanted their own stylist….Stitch Fix is for you. I also think it is great for helping you find pieces for your wardrobe that you wouldn’t normally even look at in the store. 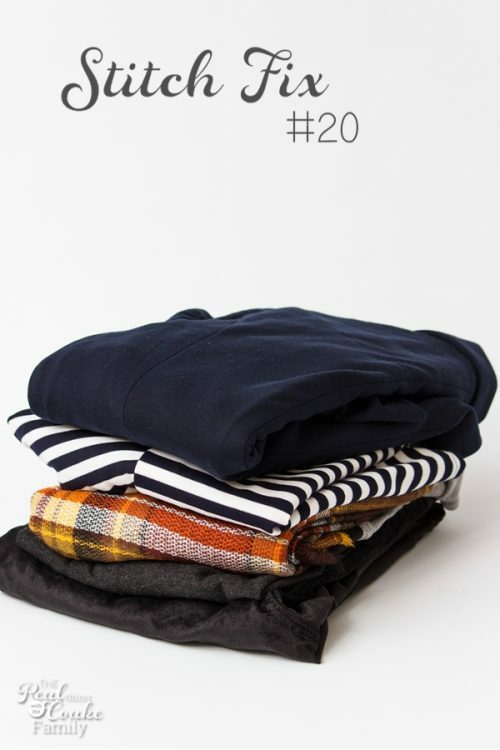 Variety can be a great thing and Stitch Fix helps with that for sure! When your fix is sent, you will be charged a $20 styling fee. Once the box arrives, try on everything in the box within 3 days. I love that I can try things on anytime I want and anytime that is convenient for me. So, you ready to see what was in the box this month? 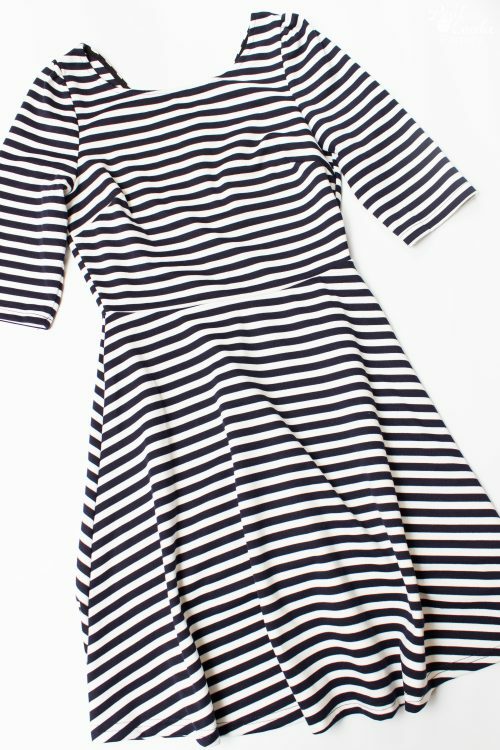 First up, I tried on the Pixley Kathy Striped Fit & Flare Dress. My stylist suggested that it would look good with this Sammie Plaid Infinity Scarf from Look by M.
She also suggested that I could wear this 41 Hawthorn Benson 3/4 Ruched Sleeve Blazer. I hate scarves and rarely wear dresses. 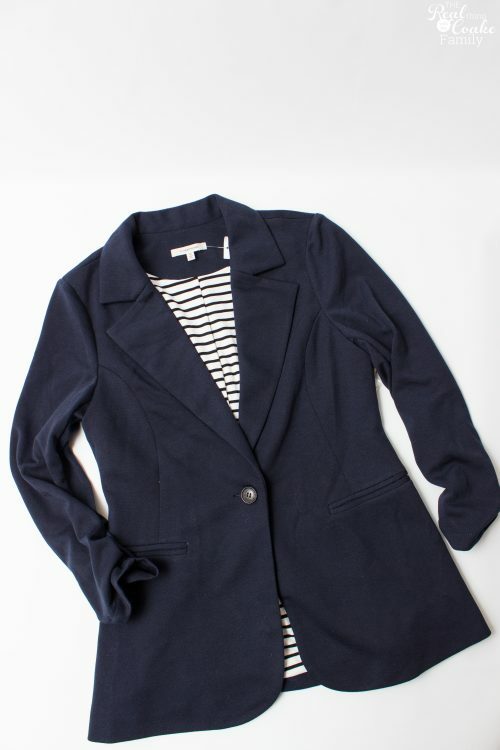 The dress is black and white while the blazer is Navy blue. 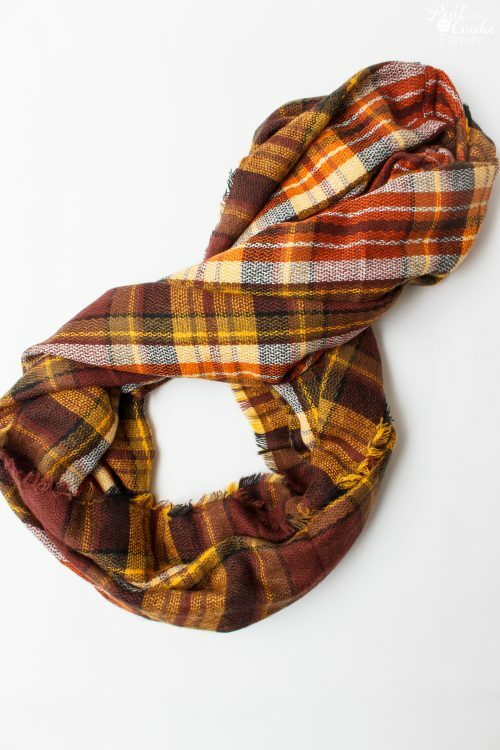 The scarf brown. Alright…I'll try it. First up, I tried just the dress on. It is a cute dress. I just don't need more dresses. I've bought three already this year and that is more than enough for my wardrobe unless I have another special event. This picture doesn't show it all that well, but for my taste this dress is also a little bit short. I decided to add the scarf next. I just feel like scarves totally overwhelm my face. Then I added the blazer. Can't you tell from my face and my body language that I totally love it? Not so much. I did like the dress with the blazer. If I worked in an office, this would be a great outfit (if the dress was just a smidge longer). I don't work in an office. I work out of my home, car, at Guitar lessons, homeschool co-op, Starbucks and lots of other places. I'm all over the place and on a daily basis, this is not a look that I need. This is the Mavi Mauli Stitch Detail Knit Top. 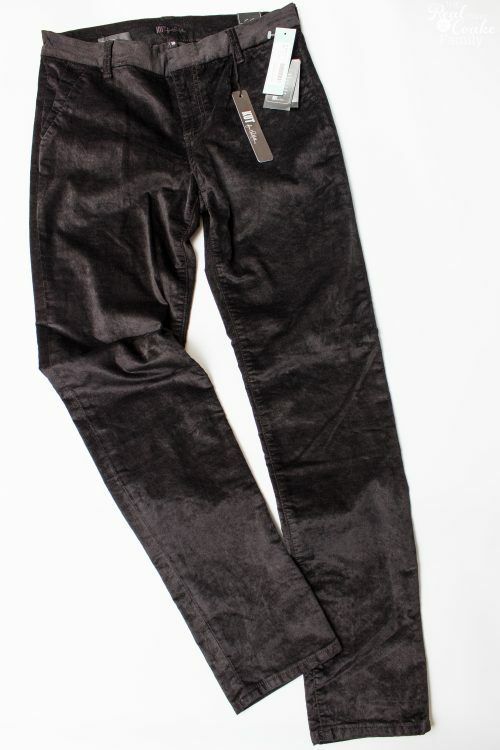 Which was to be paired with the Kut from Kloth Sonya Velveteen Slim Straight Leg Pant. Yep, this might be my crazy face look. I was so not into this box, it was really hard to shoot all the pics for you guys. I was just over it. The pants were OK. I just didn't love them and I couldn't see myself wearing them often. They seem like great dressier pants. I need everyday things….which I have told my stylist a lot, but they switch my stylist out every month and I don't know what gets passed along. I haven't been able to use the new app because it is only iOS not Android. Do those of you who have the app feel like you get any different attention? I'm not a fan of black and navy blue together…I sound so stinkin' picky with this post. My stylist said this blazer would pair will with this outfit. It does look OK, but I do think it looks weird to have long sleeves under the 3/4 length sleeve…again I feel like it sounds so picky. Is anyone with me…or do I need to broaden my fashion horizons? This is what I thought of the outfit. I liked the shirt, so I decided to try it with something I liked. I paired the shirt with a pair of capris from another fix. This I like. The only thing that I think I may end up regretting is that the sleeves are a tiny bit short on my arms(a common problem for me) and I have a feeling as I wear this shirt it is going to drive me nuts how I'm always pulling down on the sleeves. 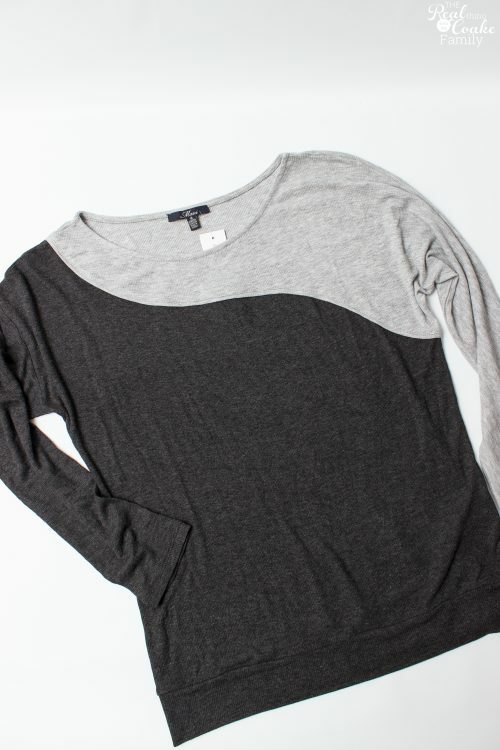 Then I decided to pair the shirt with my most favorite Stitch Fix item. This fun striped cardigan. Love it! This is something that can keep up with my lifestyle. So, now you know my family got in on the photo bombing while I was photographing…you ready for when the photo shoot got fun or possibly when I yelled at my kids because I was grumpy with the Stitch Fix box. First to photo bomb was our dog Ginger. Then my kids got in on the mix. Pumpkin was not going to leave even by force. 😉 Look at her smiling! Not to be outdone, Snowflake had to jump in for some of the fun. What would your Stitch Fix Review have been of this box for me? Leave your comments below. I'd love to hear what you think. Thanks for your comments. At least it helps me feel not quite as crazy. 😉 Hopefully my next box will be better. Totally agree with your comments & reasons for returning clothing. For myself, I would never subscribe to this service! I’m pleased with purchasing only brand name women’s size clothes: Ralph Lauren, Tommy, Eileen Fischer in natural fibers. For exercising & “at home” wear, I buy Lands’ End casual slacks & tops in cotton as well as down vest & jackets. I order on-line from Bloomingdale’s & Lands’ End. Thanks for sharing your photo shoot! I have overall enjoyed Stitch Fix for the variety it brings into my life that I would never otherwise even try. I have, as evidenced in the box, had a few boxes that just stunk, but since overall it has been good, I’ve continues with it. I like your ideas, but for me they seem like they would take up too much time. I would take forever to figure out what to order. 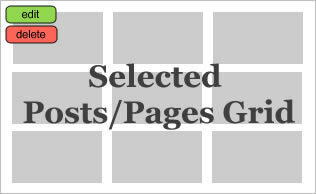 Do you have any issues with sizing? Sleeve lengths are also an issue for me. I most likely would pull the sleeves up since you will probably never be able to keep them down. As for the dress, I thought that was cute on you and it was cute with the blazer. But if you aren’t a dress wearer than you will probably never wear it. I agree, the box was a bust. The dress was cute, but too short and the scarf was a very odd choice, I would have worn that scarf with a nice thick sweater for the fall or winter. The shirt you kept looked great, and I agree with Jil, just pull the sleeves up, it will look much better and some bangle bracelets. I like the shirt and totally agree with you on the rest. The asymmetrical colors on the shirt are slimming. But that blazer has a terrible cut. I love these posts! Just an FYI- when you get a box you love and feel like that stylist seems to understand your needs and style, you can put **SAME STYLIST** in the final comments box just before the final checkout button. You can also request stylists by name if there was one in the past that you remember. Thanks! That is just what I did on my next box (which there is a new post up about on my blog). There is a stylist that I usually have good luck with, so she styled my next box. Thanks for the tips for everyone! I have gotten 3 fixes and have had a different stylist every time. My December box had everything wrong. I’m 5’2″ and they sent me 32″ jeans (I specified 28″-30″) and a petite blouse (I specified no petite tops). It barely covered my belly button. Hoping January is better. Yeah, I really wish they would just assign us a stylist so that stylist could get to know us a bit more. Maybe something like that after trying about 3 or 4 stylist. Then we get to pick our favorite. I just got my latest box and they sent me a size that I have told them a ton of times is the wrong size. It can be frustrating in the moment, but overall if I look at my wardrobe now versus before I started with Stich Fix, the overall change is fantastic!